Mayor Paul TenHaken wants more Sioux Falls and regional artists highlighted in the city, so this week the first-term mayor and former Dordt College art major announced a new rotating art exhibit at City Hall. 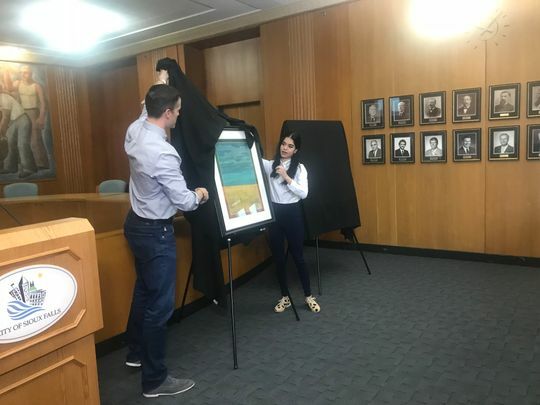 During a press conference Friday morning at City Hall, TenHaken, members of the Sioux Falls Arts Council and local artists unveiled a series of art pieces that will be the first of a permanent exhibit that will rotate every several months. The pieces will showcase different regional artists’ work featuring regional history, culture and vision. TenHaken, an artist himself, said embracing the arts is a priority for his administration, and putting pieces on display in both his office and the City Hall lobby sends that message. The first round of exhibit displays include three different pieces — two paintings and a sculpture. The sculpture, called “Daughters of Peace,” is a bronze sculpture by Aberdeen artist Benjamin Victor that depicts two young girls standing in front of their mothers and sharing their dolls. According to a city news release, it symbolizes a gesture of future peace between all cultures. “Daughters of Peace” was the 2012 Sioux Falls Sculpture Walk People’s Choice Award winner. The first painting unveiled is called “Looking at North Dakota,” an oil on panel piece by the late Robert Aldern. Both TenHaken and Alex Hagen, president of the Sioux Falls Arts Council, offered their appreciation to Aldern’s wife, Joey Aldern, for agreeing to display the piece at City Hall. Sioux Falls-based artist Rodger Ellingson’s “The Band,” a bright, colorful canvas painting depicts the Festival of Bands with musicians marching in front of the State Theater in downtown Sioux Falls. Hagen said the Arts Council, community artists at large and the entire community will benefit from exposing and showcasing more local artists to the public.